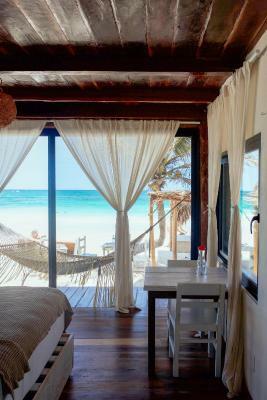 Lock in a great price for Hotelito Azul – rated 8.9 by recent guests! Everything about our stay was heavenly! Will definitely return! Gorgeous hotel! Very well designed and peaceful ambiance. Tulum has a good amount of algae near the shore, which on our first day worried us that the beach wouldn’t be as enjoyable. But everyday before we woke up, they worked hard to clean up everything. We had the cleanest part of beach by far! Upon arrival, we were offered the opportunity to upgrade from a jungle suite to a beach front suite for only a nominal fee. It was 1000% worth the additional investment. Waking up to sunrise over the ocean at Hotelito Azul was a spectacular image that I'll never forget. On top of the atmosphere, the staff was incredibly accommodating to our requests and assisted us with a scooter rental that significantly enhanced our stay in Tulum. Thank you, Luis, Omar and Roxana + the rest of the Hotelito Azul staff. You were great! Right on the beach. Everyone was so nice. The concierge Ormar made sure we were taken care of. My husband and I spent our 1 year anniversary here and had the most incredible experience. Everything from the staff to the food was nothing short of perfect! Staff is incredibly accommodating and friendly and the concierge, Omar, was incredibly helpful. He actually had great recommendations so wish we would have waited to book any excursions because he booked everything from the excursion itself to a car service and it ended up actually being cheaper than what I would have found online. He even offered to make restaurant reservations and had great suggestions. Luckily, we had only booked stuff for the first two days so had 5 days to try out his recommendations. The cocktails here are also amazing! Food was amazing and so fresh. Absolutely plan on using this place our next visit! There aren’t words to describe how special this place is. Our overall stay was truly wonderful. Our room was beautifully unique and comfortable with a beautiful view of the ocean. Nothing was never any trouble for the staff, Omar in particular was fantastic! And the beach was gorgeous (we had no seaweed problems)!! Service was outstanding! Concierge was at our disposal and even delivered hot water to our patio during the stormyest weather. We arrived and met with Priscilla and another sweet gal her name escapes me but pleasant and helpful. Second half of our stay we met with Omar and Tony both extremely helpful but we did put the bulk of our requests on Omar and he made the stay fun and easy. Perfect location, comfortable beds, beautiful views. Breakfast was excellent! Service was second to none! Thank you Yesica, Tony, Efrain, Elias, Paulino and Julio! 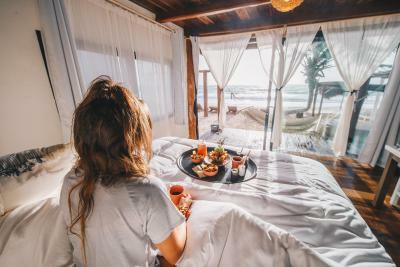 Our stay was as close to perfect as it could be with the exception that the seaweed was bad at the end of our trip..
Hotelito Azul This rating is a reflection of how the property compares to the industry standard when it comes to price, facilities and services available. It's based on a self-evaluation by the property. Use this rating to help choose your stay! 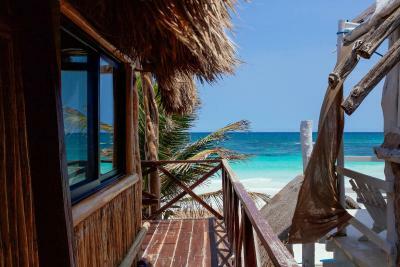 Set in Tulum, 3.7 mi from Tulum Archaeological Site, Hotelito Azul has a number of amenities including a private beach area and free WiFi. 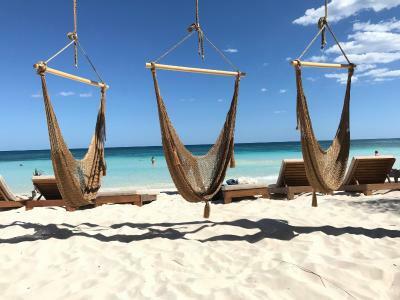 Open since 2017, this 4-star hotel is within 3.1 mi of Parque Nacional Tulum and Cesiak. Guests can have a cocktail at the bar. At the hotel, rooms are fitted with a desk. All rooms include a private bathroom with free toiletries and a hairdryer. All rooms at Hotelito Azul are equipped with a seating area. Guests at the accommodations can enjoy an American breakfast. Hotelito Azul offers a terrace. The area is popular for cycling, and bike hire is available at this 4-star hotel. Tulum Bus station is 3.1 mi from the hotel, while Bus station Tulum Ruins is 3.7 mi away. The nearest airport is Cozumel International Airport, 42 mi from Hotelito Azul. 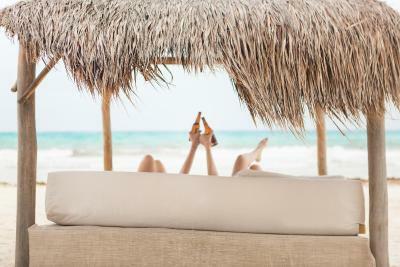 When would you like to stay at Hotelito Azul? House Rules Hotelito Azul takes special requests – add in the next step! Hotelito Azul accepts these cards and reserves the right to temporarily hold an amount prior to arrival. There is no pool even if there is one in the pictures. The receptionist were nice except Roxane who really was unpleasant for many times. There is nothing except the shower gel, shampoo and the conditioner, no cotton, no hairdryer, no slipper. There is no gym. The bed is not comfortable but large. The bikes were a little rusty and some of the seats couldn't be adjusted to meet your height. I wish you could rent them for 24 hours or a discount for a week rental as well. Avoid Wednesdays if you can as there is a loud, noisy club across the street that parties until 4 AM (getting louder at 1 AM) and kept us up at night. We brushed it off and were okay (it's Mexico after all!) Lastly, email communication between the hotel and myself before our trip was poor. I wished management was more responsive. The coffee brought to our room every morning was delightful! The breakfast was very filling and so delicious! Our room was beautiful. The king size bed was so comfortable! Our shower was amazing and the toiletries were custom made and really nice. I enjoyed the staff as everyone was super friendly and helpful! Lastly, the access to the beachfront was perfect. Having the amazing restaurant attached to the hotel was beyond my expectations and really came in handy as many other places on the beach require you to spend $50 per person to lounge in their chairs. Our food was better and you could spend as much or little as you wanted/needed. I loved it all to be honest. Everything was great at this property. Niche boutique hotel with great location, nice staff and delish food! We had a bit of bad smell in our room from tie to time during the week. New Years Eve around midnight was non existant. The Staff were fantastic and very friendly. The small resto provided tasty meals. The bar choices were a little limited as were the activities. That being said, a very relaxing place. The whole Staff (Hotel and Restaurant) was wonderful! They upgraded us to another room after we complained about generator and construction noise that was to hear from out initial room, so in the end we were really able to enjoy our last days in tulum in peace. The rooms are beautiful, clean and spacious. There was a lot of seaweed, but this was up and down the coast not just this hotel. Mother Nature, but not pretty! Wifi is absolutely awful which was difficult for us from a business side of view. The sands king room we stayed in was outstanding, waking up to the view of the sea every morning was beautiful. The staff were extremely helpful. Especially Omar the front desk concierge forever a smile and lending a helping hand. The room and bathroom is very chic and very comfortable beds. I loved our room overlooking lots of beautiful palms. Our room was not overlooking the beach but that is not a problem when it only takes 3 seconds to go to the beach. 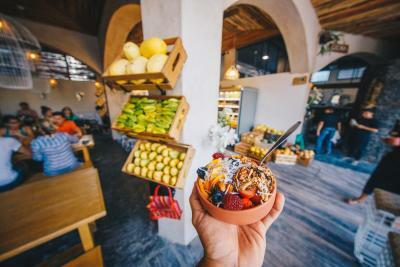 The little restaurant in front of the hotel is beautiful and serves delicious fresh healthy food And they serve the breakfast. We loved that it is a small hotel with a perfect location right at the beach. Don’t worry about seaweeds, if there is any the staff will remove it. The beach is beautiful. We loved the barefoot atmosphere this small hotel gives you and the staff are amazing. We have been traveling a lot around the world and stayed many lovely places but this place we will remember because of the staff and the positive feeling and comfort of minimalistic luxury. 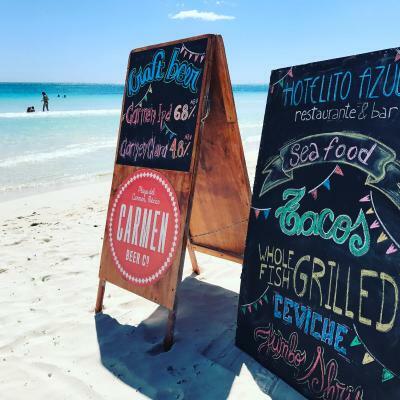 we would love to come back to this place and to visit Tulum. A pool would be great as the ocean is a bit rough to swim certain times of the year but I believe they are currently constructing one which will be awesome!